Sunless Tanning: Caribbean Solutions, Alba Botanica, Natures Gate! 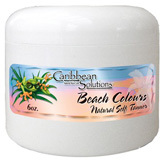 • Beach Colours Natural Self Tanner: A truly natural self-tanner that uses no dyes and artificial coloring agents. Beach Colours uses natural DHA, a vegetable substrate obtained from sugar cane that colors dead skin cells and energizes one's own dark pigments to produce the skin's natural darkening process. The moisturizers of the natural DHA helps keep the skin from drying out while speeding the natural coloring of the skin. Made with organic Aloe Leaf, Cucumber and Melon extracts, Shea Butter, and Mandarin Oil helps rejuvenate and condition the skin during the quick coloring process so it does not risk drying out. Formulated with no Parabens, only food grade Natural Sorbate, natural plant extracts, and natural Vitamin E from corn. Fragrance free. 6 oz. ORDER TODAY! Ingredients: Deionized water, Natural derivative DHA, Squalene, Shea Butter, Cucumber extract, Melon extract, Emulsifying wax..
• 1000 Roses Color + Correct Sheer Tan SPF30: 1000 Roses Color + Correct Sheer Tan SPF30 is a moisturizer with Alpine Rose Stem Cells to offer soft, sheer mineral coverage with essential moisturization, cellular support, and proven broad spectrum UVA/UVB sun protection for a naturally, impeccable complexion in one easy step. Color + Correct Sheer Tan SPF30 provides a mattifying tinted-coverage, complements medium complexions/yellow under tones, and comfortable for daily use. For delicate and dry skin. Nanoparticle free and Dermatologist Tested. 2 oz. ORDER TODAY! Active Ingredients: Zinc Oxide 20.0%. Ingredients: Aloe Barbadensis Juice, Simmondsia Chinensis (Jojoba) And Helianthus Annuus (Sunflower) Oils, Sorbitan Stearate, Glyceryl Stearate, Fruit Stem Cells (Alpine Rose, Malus Domestsica, Solar Vitis) And Bioactive 8 Berry Complex, Soothing Complex: [Hyaluronic Acid, Magnolia Officinalis Bark, Phoenix Dactylifera (Date) Leaf Cell And Boswellia Serrata (Boswellin) Extracts], Caprylic/Capric Triglycerides, Rosa Damascena (Rose) Distillate, Rosa Canina (Rosehip) And Punica Granatum (Pomegranate) Oils, Algae And Cucumis Melo (Melon) Extracts, Iron Oxide, Magnesium Sulfate, Zea Mays (Corn) Starch, Camellia Sinensis (White Tea), Aspalathus Linearis (Rooibos) And Hibiscus Sabdariffa Extracts, Tocopherol (Vitamin E), Phenethyl Alcohol, Ethylhexylglycerin, Pelargonium Graveolens (Rose Geranium) Oil, Rosa Centifolia (Rose) Oil. SUN TANNING: 1000 Roses Color + Correct Sheer Tan SPF30, 2 oz. • Sunless Tanner Self Tanning Lotion: Get the look of a natural tan without exposure to the sun. Sunless Tanner provides a natural looking tan while lightly moisturizing and calming skin, with a classic blend of Aloe and Olive oil. Free of Parabens, Phthalates and Oxybenzone. NOTE: For optimal results, exfoliate skin before applying. Evenly apply Nature's Gate Sunless Tanner on all body parts. Start with a light layer and re-apply for a darker tan. Wash hands immediately with soap and water after application. Avoid contact with fabric until dry. Tan will begin to appear within 1 day of application. 4 oz. ORDER TODAY! Ingredients: Water (Eau), Caprylic/Capric Triglyceride, Dihydroxyacetone, Glycerin, Sorbitan Stearate, Cetyl Alcohol, Glyceryl Stearate, Behenyl Alcohol, Cetearyl Alcohol, Cetyl Ricinoleate, Dimethicone, Aloe Barbadensis Leaf Extract, Camellia Sinensis (Green Tea/thé vert) Leaf Extract, Hibiscus Sabdariffa Flower Extract, Rubus Idaeus (Raspberry/framboise) Fruit Extract, Olea Europaea (Olive) Fruit Oil, Lauryl Alcohol, Myristyl Alcohol, Palmitic Acid, Stearic Acid, Polysorbate 60, Squalane, Sclerotium Gum, Lecithin, Citric Acid, Potassium Sorbate, Phenoxyethanol, Fragrance (Parfum), Caramel. SUN TANNING: Sunless Tanner Self Tanning Lotion, 4 oz. • Hawaiian Coconut Dry Oil Sunscreen SPF 15: Getaway to paradise with this tropically alluring dry oil with sunburn protection. Made with selected sunscreen ingredients, this silky oil blends fast to leave skin soft, smooth and not greasy. Coconut oil, Shea Butter and Vitamin E help keep sun-exposed skin nurtured, hydrated and healthy-looking. Water resistant (40 minutes). Paraben free. 4.5 oz. ORDER TODAY! Active Ingredients:Homosalate-10.0 %,Ethylhexyl Salicylate -5.0 % ,Octocrylene -3.0% Other Ingredients:Carthamus Tinctorius (Safflower) Seed Oil, Ethylhexyl Palmitate, Cocos Nucifera (Coconut Oil), Butyrospermum Parkii (Shea Butter), Citrus Aurantium Dulcis (Orange) Oil, Citrus Grandis (Grapefruit) Peel Oil, Ocimum Basilicum (Basil) Oil, Daucus Carota Sativa (Carrot) Seed Oil, Macadamia Ternifolia Seed Oil, Tocopherol Acetate , Phenoxyethanol, Coumarin, Limonene, Linalool, Fragrance (Parfum). • Natural Very Emollient Sunless Tanner: Golden tanning without the sun! When you just require a slight sun-kissed glow, our easy-to-use, non-streaking self-tanning lotion absorbs fast for a natural-looking tan in less than 3 hours. The formula is all natural. 100% Vegetarian. No: Animal Testing, Artificial Colors, Parabens, Phthalates, Sodium Lauryl Sulfate or Sodium Myreth Sulfate. 4 oz. ORDER TODAY! Ingredients: Aqua (Water), Dihydroxyacetone, Glyceryl Stearate SE, C12-15 Alkylbenzoate, Carthamus Tinctorius (Safflower) Seed Oil, Prunus Amygdalus Dulcis (Sweet Almond) Oil, Dimethicone, Cetearyl Alcohol, Cetyl Alcohol, Glycerin, Stearic Acid, Ceteareth-20, Butyrospermum Parkii (Shea Butter), Calendula Officinalis Flower Extract, Camellia Sinensis Leaf Extract, Chamomilla Recutita (Matricaria) Flower Extract, Echinacea Angustifolia Extract, Ginkgo Biloba Leaf Extract, Citric Acid, Erythrulose, Isopropyl Palmitate, Lactic Acid, Retinyl Palmitate, Sodium Citrate, Steareth-20, Tocopherol, Xanthan Gum, Benzyl Alcohol, Potassium Sorbate, Phenoxyethanol, Benzyl Benzoate, Benzyl Salicylate, Butylphenyl Methylpropional, Geraniol, Hydroxycitronellal, Hydroxyisohexyl 3-Cyclohexene Carboxaldehyde, Limonene, Linalool, Fragrance (Parfum). SUN TANNING: Hawaiian Coconut Dry Oil Sunscreen SPF 15, 4.5 oz. SUN TANNING: Natural Very Emollient Sunless Tanner, 4 oz.